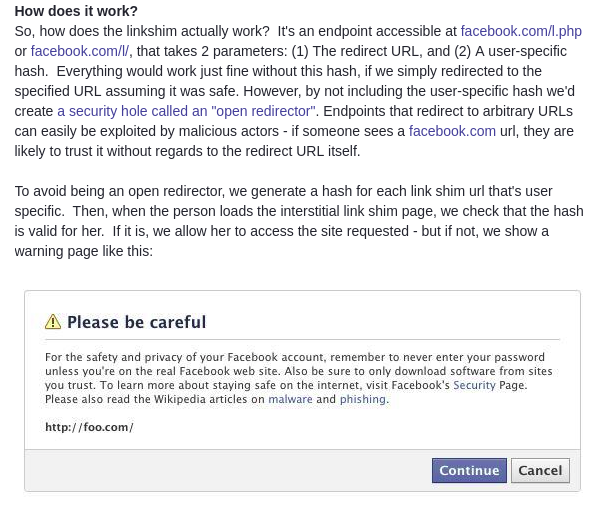 That was a Brief detail about Link Shim. The Redirect URL (Domain where you’re Going to be Redirected). A Specific Hash (A Hash Generated for a specific domain you’re trying to visit). But if you wanna read more about Linkshim, Here’s a Detailed writeup on it. So when I was testing it, something that caught my attention was that the Server wasn’t Validating the Hash. I managed to change the URL to another site without changing the Hash and it Worked. I have shortened the URL so that you could understand it better. Now u is the Domain and h is the Hash. So what I did, I simply changed the u (Domain) to another Domain without changing the Hash and It just Got Redirected. So I didn’t waste my Time and Reported it to Facebook and Got this Reply. So that was a False Positive. No Problem. 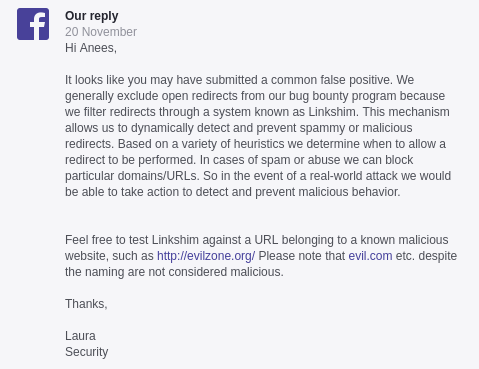 But wait they said that Feel Free to test Linkshim against a URL belonging to a known malicious website, such as http://evilzone.org. So that was the issue. I tried different methods to Bypass this But all in Vain. And Suddenly One of My recent Bypasses Came into My Mind. I gave it a Try and Fortunatley it Worked and the Linkshim was Bypassed. I went to goo.gl and shortened the URL which was evilzone.org and got something like https://goo.gl/7bXgxB. When I implemented it on the Vulnerable URL I was able to redirect to the Evilzone.org. I was Very Happy But Unfortunatley Redirects are Not Accepted By Facebook. I Hope you Enjoyed the Writeup. If I’ve made a Mistake Somewhere Kindly Rectify it.